SHOP (Southside Hub of Production), founded in 2010 by Laura Shaeffer and John Preus, and relocated to 57th in 2014, is a collective of artists, writers, film makers, craftspeople, educators, and local civic organizations who have come together to create a local cultural hub space in Hyde Park, Chicago. Shop’s main aim is to stimulate local cultural activity and to foster artistic and cultural enrichment in the neighborhood, with the aim of reclaiming the commons, and the networks of interdependency that create a fulfilling economy. 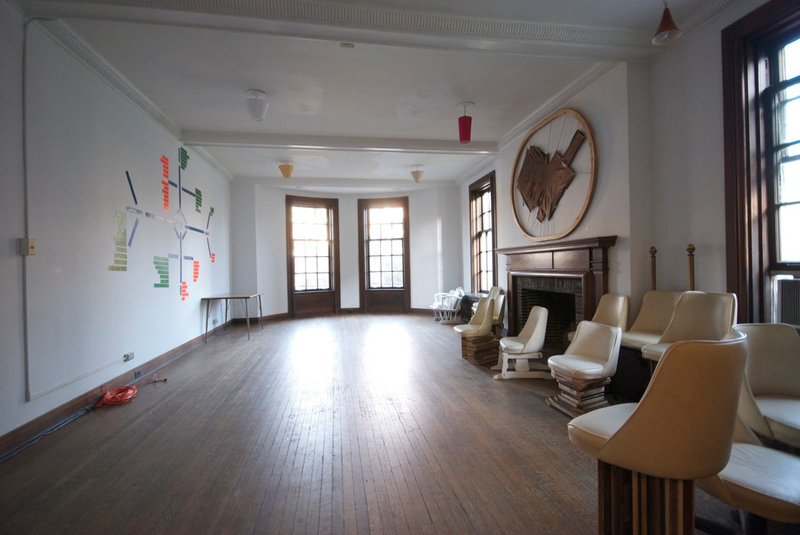 The building has exhibition space, artist studios, a woodworking shop, a space for movement and bodywork, the Hyde Park Kunstverein – a community museum, Red Flags family salon and non-sports pub, space for public meetings and more. Events in the house, include film series, exhibitions, weekly potluck dinners, performances, lectures, and salon evenings. Workshops and classes will feature visual arts, writing, meditation, music, wood working, cooking, and more. story space for kids. SHoP invited different story tellers for various events. Pizza party in Red Flags Salo(o)n, a small 8’x 10′ pub designed and built by Preus, with guest bar tenders serving up local brews donated by Revolution and Half Acre. SHoP invited guest servers to tend, and to show video work on the single TV screen. Red Flags at night. The design was based on its location in proximity to the The UC business school, Frank Lloyd Wright’s Robie House, which was across the street, and Rochefeller Chapel. write up in Chicago Mag. Poster for an event that featured Low Tide. Link to a piece Preus wrote for AREA magazine on SHoP. Autonomous kid’s space, with materials provided by the Resource Center, and tools donated by local residents. Dan Peterman’s “Library”, and installation during the exhibition, This House is Not a Home, curated by Preus and Shaeffer.